Have you heard of Shoetique? Well in 2009 they started their online store after running their independent footwear shop at Hale in Cheshire, they have over 30 years experience in the footwear industry. In 2015 they received the Independent Footwear Retailer of the Year Award. When I was contacted to see if I would like to review something how could I say no with my shoe fetish. 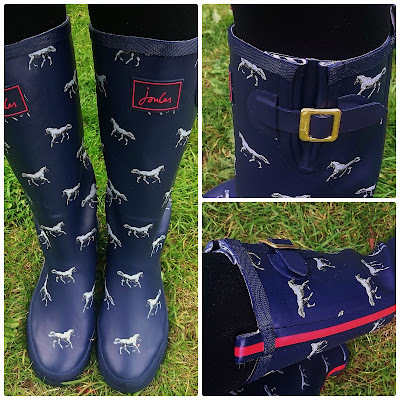 Now with the summer coming to an end the one item I was seriously lacking in my wardrobe was a decent pair of wellingtons and with this in mind I chose these gorgeous Joules French Navy Horse print ones, priced at £40, although they are now in the sale at £29. The cushioned insole is so comfy and hopefully they will keep my feet warm and dry when I am at the stables with my daughter and also on those long country walks. I love everything about these boots from the red piping details down the centre of the back and the cute buckle meaning that I can alter the width to fit my calf, they look so stylish on. Shoetique offer a vast assortment of shoes, wellingtons, sandals, boots, slippers and trainers all from well known brands. Standard delivery is free of charge and they also offer free exchanges and easy returns. Shoetique also offer a Price Match Promise whereby if you find the item cheaper anywhere else they will match the price and also deduct 10%, you really can't go wrong. I was sent this item free of charge for the purpose of this post. What lovely looking wellies. I love Joules. I like Shoetique too, I have seen their website before. I adore Joules as a brand! What a bargain these boots were! Love the colour. These a gorgeous! Such an affordable price too for good quality. I absolutely love Joules, these wellies were a steal! The style is so cute, perfect for the cooler fall months and ambling around the countryside. I can't wait to have a browse of their shoe website! Living in the country means wellies are a necessity, but it's hard to find ones that look good. These would certainly fit the bill. Oh I love these! I need wellies but never buy them because they're all so boring usually. Those wellies are gorgeous - love that they are adjustable too! I have definite wellie envy! My Hunters died last week after 8 years of loyal service!